Jac o' lyn Murphy: Ships Ahoy! They will be part of the centerpieces for a cruise on the Bay. Hi! Thanks for visiting my blog. Your comments are too kind. 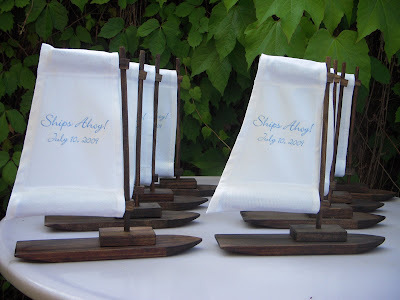 My husband and I LOVE these mini sail boats. Did you make them? I am so glad I found your blog! I assembled the boats, stained them and printed the information on the sails. They were a lot of fun to do.